Biology students have conducted fieldwork in Costa Rica and Chilé during the summer. Chemistry students have investigated proteins, DNA, cellular damage from oxidants, and the creation of new molecules. Computer Science students have partnered with Cleveland Clinic radiologists to develop software that allows doctors to read X-rays remotely. English and History students have published articles in prestigious academic journals and literary magazines. Neuroscience students have won first place for research papers in 24 out of the last 25 years at the Eastern Colleges Science Conference. Physics and Engineering Physics students do research with JCU faculty in the summer leading to presentations at regional and national conferences, and co-authorship on journal publications. Psychological Science students have presented research findings at conferences such as the Midwestern Psychological Association’s Meeting in Chicago and the Ohio Undergraduate Psychology Research Conference. Sociology students participate in a poverty and solidarity program in the Cleveland area. Funding for student research is available in many JCU academic departments. See the Guidelines for Colleran-Weaver Research Fellowships for research funding opportunities. 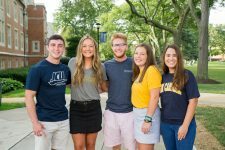 Each spring, the John Carroll community gathers for the Celebration of Scholarship to recognize the outstanding student and faculty research that takes place throughout the year.